It’s hard to put Canary into a single product category. Is it an IP security camera? Yes, but it also monitors the air quality in your home and has some features normally associated with a home security system. Canary is definitely not your average bird. 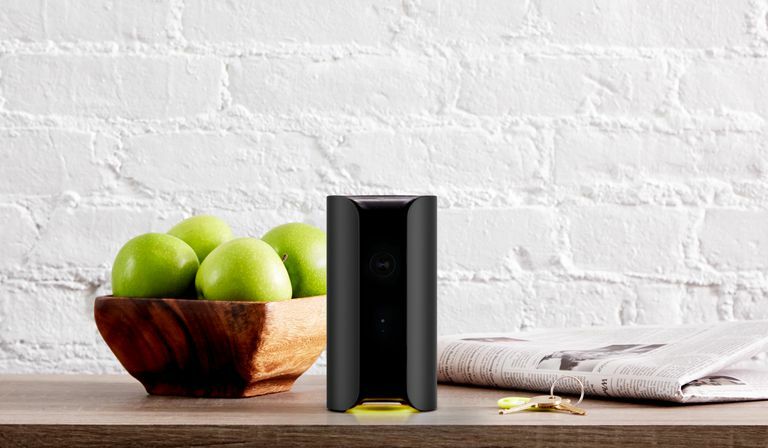 Canary seems to be one of the first entries to define the new product space of "all-in-one home security devices". Its competition includes iControl Networks’ Piper and Guardzilla, to name a few similar products. Before you even set up the Canary, you get a sense that a lot of thought went into this product. As you take the Canary out of its packaging, you feel as if you’re unboxing an Apple-branded product due to the attention to detail. From the way the unit’s camera lens is protected by a custom fit plastic cover, to the way that the setup cable is wrapped in a tight spiral, Canary wants you to know that this product is much more than just a run-of-the-mill security camera. I’ve reviewed several IP security cameras in the past, but none like Canary. Its inventors clearly had aspirations of creating a device that could monitor more aspects of your home than just who's walking in the door. From unboxing to watching livestreamed video on a phone, Canary's setup took about 10 minutes. The instructions consist mainly of plug Canary into the wall, download the latest app, connect your Canary to your phone with the included audio sync cable (or via Bluetooth on some newer editions of the hardware), and wait while the device is updated and configured. Once Canary's app informs you that all has been set up, you can then start using the app on your phone to watch live video, recorded clips from activity that was detected, and also monitor the temperature, humidity, and overall air quality of your home. The Canary provides a wide-angle panoramic view of whatever is in front of it. Wherever you decide to place your Canary, your going to want it near the edge of whatever platform (table, shelf, etc) you place it on or otherwise the bottom part of your image frame is going to just show a lot of table because Canary doesn’t have any adjustments for tilt, it's made to go on a flat surface. In order to provide viewers with a panoramic view of the room, the Canary's lens has quite a noticeable “fisheye” look to it, with the typical edge distortions and image curving that increases as objects move further away from the center of the image. The good part of the trade-off is that you can see much more of the room than you could without the panoramic fish-eye lens. The image itself is 1080p, the focus is fixed, and as a result, the details of the images are sharp. When not using night-vision mode, color quality seems to be as good as many dedicated security cameras that I’ve seen. The Canary also features a pretty solid night-vision mode, you can visibly tell when the unit is in night vision mode by the telltale IR emitters that surround the camera and provide the IR light needed to illuminate the scene. You can also hear a slight click in the camera when night vision is engaged and when it is disengaged as well. The uniformity of the night-vision image was excellent, there was no flashlight type “hot spot” evident at all as there is with some other night-vision cameras where the center is white hot, but the edges are dark and blurry. The Canary's image looked great in both day and night modes. One of the outstanding features of the Canary was its use of location-based “geofencing” for various tasks. It uses the location-aware features of your cell phone to determine your location in relation to where Canary is. This allows it to arm itself for motion recording and notifications when you leave home and then disarms itself (turn off notifications) when you arrive home. This makes for a set-and-forget experience. You don’t have to wonder “did I arm the system before I left” because it arms itself as you leave the area. You can add other phones to the system and set it so that the system won’t arm until everyone has left the area and will disarm as soon as one of the designated phones enters the premises, this prevents constant notification alerts should someone stay at home or come home early. Although Canary has both siren and motion detection features, Canary won’t sound a siren if it detects motion while armed. It leaves that decision to sound the siren up to the remote viewer. Canary will notify you of a motion activity via the app and then while you are viewing the screen, there are two options at the bottom of the screen. “Sound Siren” and “Emergency Call”. The siren button will remotely sound the alarm in the Canary while the Emergency call button acts as a shortcut to your preset emergency numbers that you set when you installed the Canary. This leaving the decision up to the remote viewer should help cut down on false alarms. This is another feature which definitely makes the Canary an interesting animal. Canary has an array of sensors that monitor the air quality of the location that Canary is placed in. This feature doesn’t feel quite fully implemented yet, unfortunately, as there is no obvious way to set up notifications associated with humidity, temperature, or air quality. With regards to the Home Health features of Canary, all that's immediately evident is a graph showing a real-time + historical view of these "home health" stats in the app, but there doesn’t appear to be any way to set thresholds for notification purposes. For instance, if the air quality got really bad really fast as this might indicate a fire or other hazardous condition. Overall, Canary seemed to be a well-thought-out feature-rich security product with great fit and finish. The image and sound quality are solid and the camera lens covers a large area. The one main drawback would be that the home health monitoring feature isn’t yet well implemented.